Samsung Galaxy Nexus is already visited UK, USA, Canada and Australia within its 1st month journey. 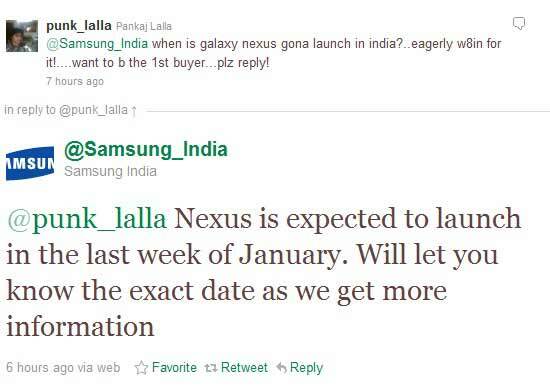 So it seems funny that Samsung is saying they need more than one month to give it to the Indian people’s hand. Samsung announced it via there twitter account. They said that the Samsung Galaxy Nexus will be released in the last week of January in India. Though there is no exact date for it as always. Other info, like pricing, we might have to wait for longer. In the mean time you can buy Motorola RAZR if you need a smartphone before next year! Price of the thinnest droid is Rs 33,490 in India now.